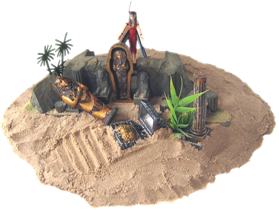 The 2-day training offers an overview of Sandplay Therapy to date, an introduction to the use of the sand tray as container and the recommended range of figurines/ symbols. The weekend is built around participant use of the Sandtray to actively experience the theoretical concepts underpinning this approach. Because the nature of Sandplay is pre-verbal and symbolic, the greater emphasis lies in the experiential component. As part of a small group of eight, there is the opportunity to work in pairs as both creator and silent witness, coming together to reflect upon the sand pictures, with the assurance that the work will be treated sensitively and will not be interpreted. With thanks to one of our previous participants who gave permission to include a slide show of her experience. Molly Wolfe trained as an Art Therapist in Hertfordshire, qualifying in 1986 and in 2002 completed an MA in Transpersonal Child, Adolescent and Family Therapy at CCPE, which incorporated a Diploma in Sandplay Studies.